On Monday July 6th, Palestinians and their supporters around the world marked the one year invasion of the Israeli attack on Gaza that ended up lasting fifty one days and costing close to twenty five hundred Palestinian lives.In Britain today, hundreds of activists held protests and occupied three different weapon factories located on british soil that are directly involved in the Israeli occupation of Palestinian land. There were simultaneous protests held in Australia, at branches of the same companies. 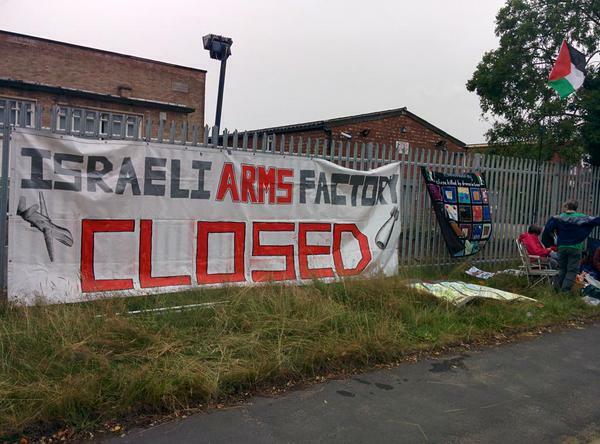 The companies are Elbit Systems in Staffordshire, an Israeli company which manufactures armored drones, Instro Precision in Kent and U.A.V. Engines in Lichfield, which manufactures drone engines for export to Israel. The activists say that these weapons are used by Israel to target and massacre civilians in Gaza. Elbit Systems is Israel’s largest publicly traded weapons company. The company has military contracts with numerous governments, including the US and UK. A report from Amnesty International stated that, “UAV Engines Ltd (UEL), based near Birmingham, has stated that it manufactures the engines for Hermes 450 UAVs (Unmanned Airborne Vehicles) produced by its parent company, Elbit Systems of Israel. Specifications displayed by Elbit Systems beside a Hermes 450 vehicle at a 2006 defence exhibition, of which we have photographs, also state that the Hermes 450 is powered by a ‘UEL AR-80-1010’ engine, made by UAV Engines Ltd.
At least ten people were arrested at the British protests on Monday, July 6th, 2015.